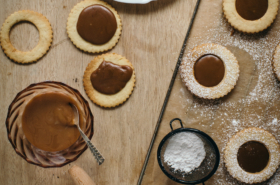 As for half of my recipes, those peanut butter & strawberry sauce chocolate cups gave me a hard time to find how to call them decently in French. In spite of the beauty of French language, many times I struggle with the fact that the name I found in English doesn’t sound so good when translated in French. 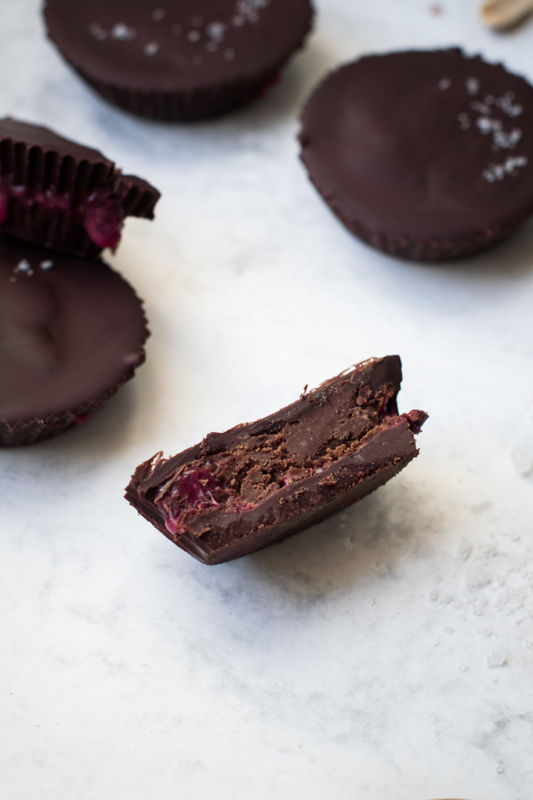 That was the case for this recipe, indeed, as many people may connect this chocolate cup recipe to its American, diabete spike-friendly and very famous cousins, which are the Reese’s cups. Let me reassure you right now, even if they may be very nutritious, mine are far to be as heavy as their American model. To be totally honest with you, I even hesitated for one second to rank them under the Health & Nutrition category, but well, I quickly changed my mind when I bit into the first strawberry sauce & peanut butter chocolate cup, which should still be eaten with moderation – at least if you don’t want to spend your afternoon doing a food coma. In spite of all my motivation to become an organised & on time blogger, I still struggle to keep this organisation when special occasions as Christmas, Fat Tuesday, or Easter are coming… Beyond having to respect deadlines – I guess this part is slightly easier for full-time bloggers, even if the struggle might still be real -, the fact to put barriers around my creativity and put my ideas into a bow or specific context feels like a brake to me and may make the task a bit less attractive than when one recipe idea is coming from nowhere, ready to be developed and tried. 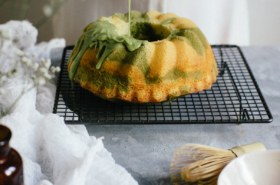 I guess that can also be explained by the fact that one characteristic of my recipes is the spontaneity with which my ideas are flowing, and as for many things in my life, I simply hate when they come through a forced way. 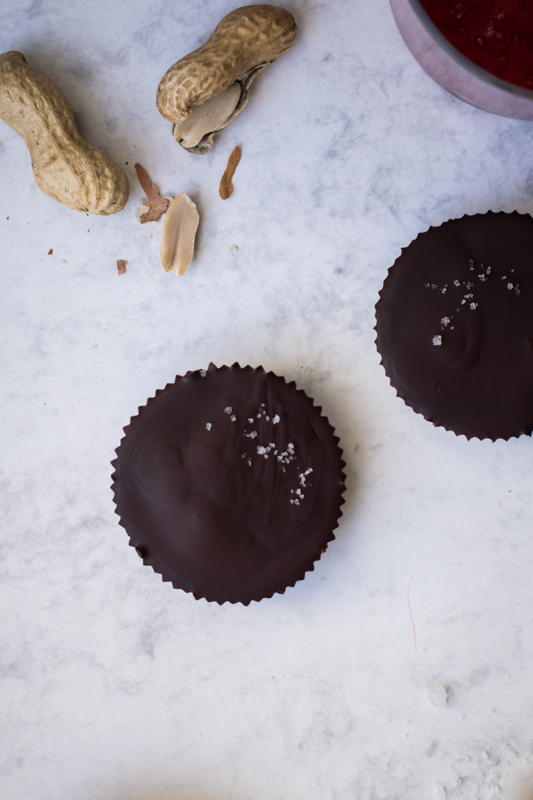 Nevertheless, I still wanted to share with you an Easter recipe, and the idea of some stuffed chocolate cups was growing in my mind since a while. 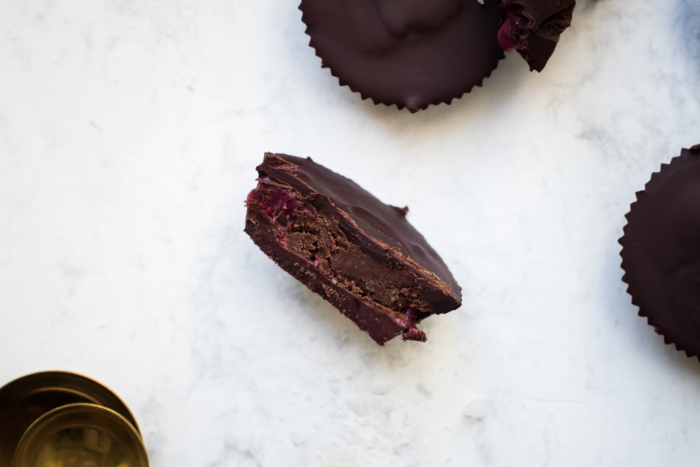 Those peanut butter & strawberry sauce chocolate cups also represent a throwback to my childhood memories as I got inspired by the cache-cache fraise – it literally means strawberry hide & seek – chocolate bars from the brand Poulain that I was crazy about to create this recipe. They were basically made from dark chocolate, hiding a very sweet strawberry sauce inside. In spite of their high amount of sugar, their taste was reminding chocolate coated fresh strawberries. 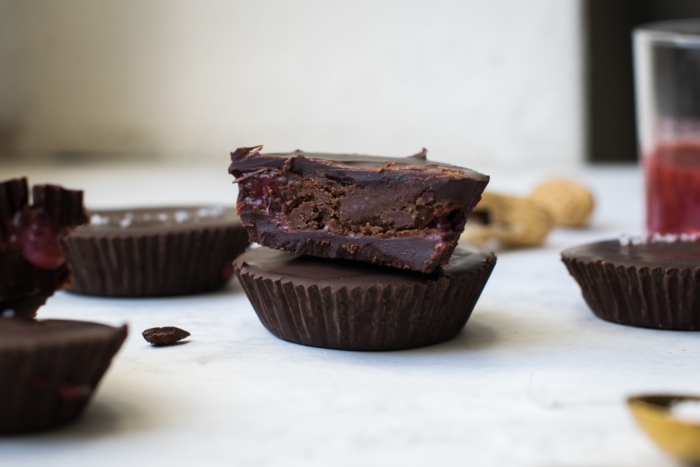 As mentioned previously, those peanut butter & strawberry sauce chocolate cups were supposed to end up in the health & nutrition category, as I wanted to recreate something healthier, without adding extra sugar. After a few attempts, I finally realised that some sweeteners were needed to balance the different tastes and reach the final result I wanted, but they are still pretty low in added sugar. 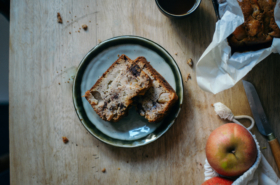 The recipe can also reminds you about the peanut butter & jam association, as it combines peanut butter and fresh fruit purée. 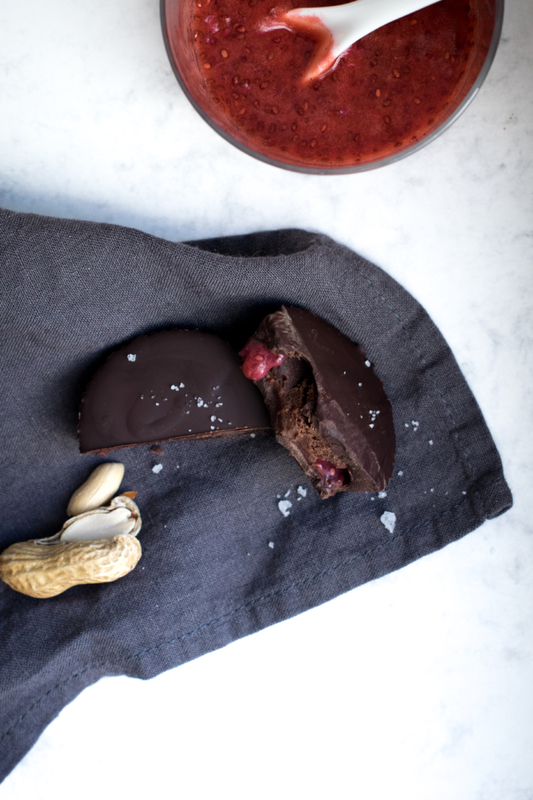 You can find the recipe of my chocolate peanut butter aka healthier Snickers© spread in my previous post. 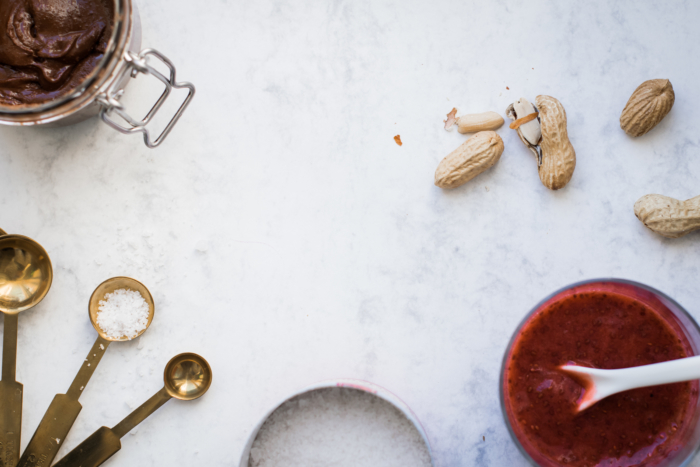 If you don’t have any food processor or blender that is powerful enough, you can still use some store-bought natural peanut butter. 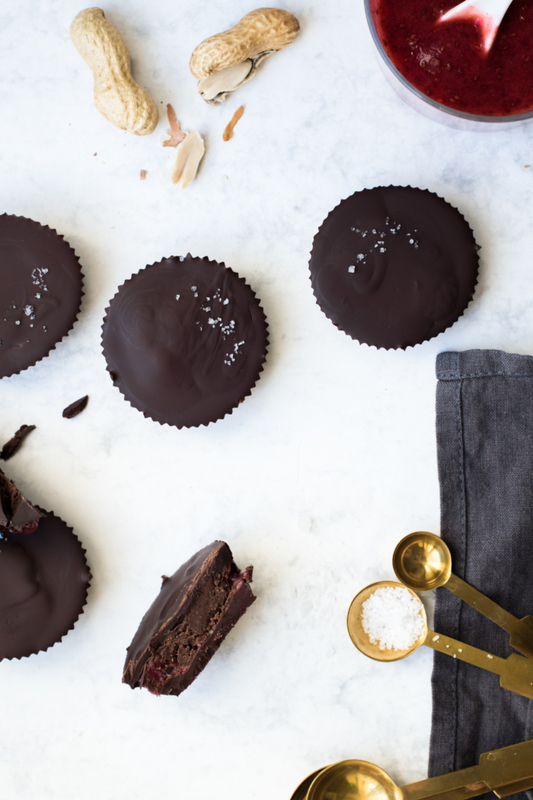 The chocolate shells are made with coconut oil and cacao, but you can switch it by some dark chocolate if you don’t want to make the chocolate by yourself. 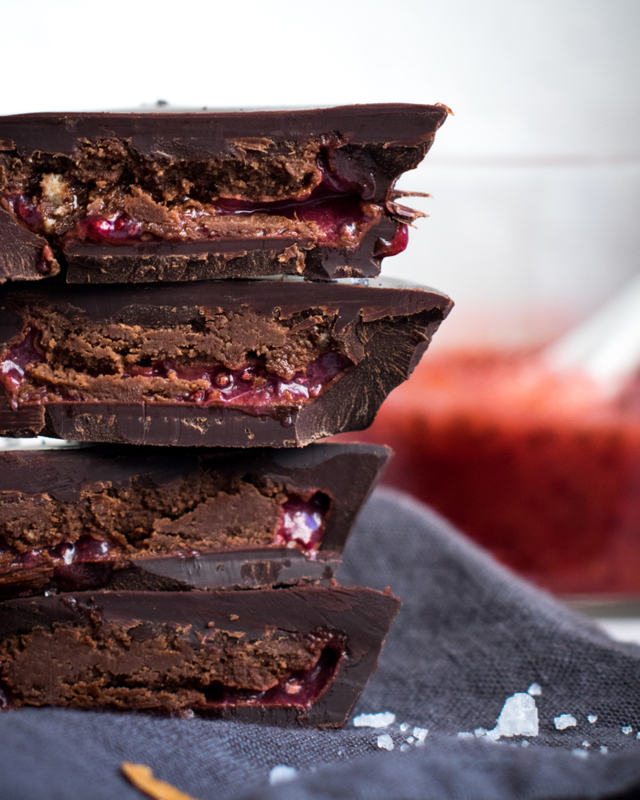 Making you own coconut dark chocolate is healthier and less sweet though, but some people may not like its strong taste, which can quickly cover the taste of the strawberry sauce. 1. Prepare the strawberry sauce: wash and hull strawberries, then cut them in pieces. In a pan over low heat, add water, strawberries, lemon juice, maple syrup and vanilla. Cover and cook for about 10 minutes, until strawberries turn into a compote. Let cool. 2. When strawberry compote is chilled. Add chia seeds to the 100g strawberry compote, mix with a blender. When the texture is homogeneous, put in fridge for 2h minimum, until the texture gets more compact. 3. 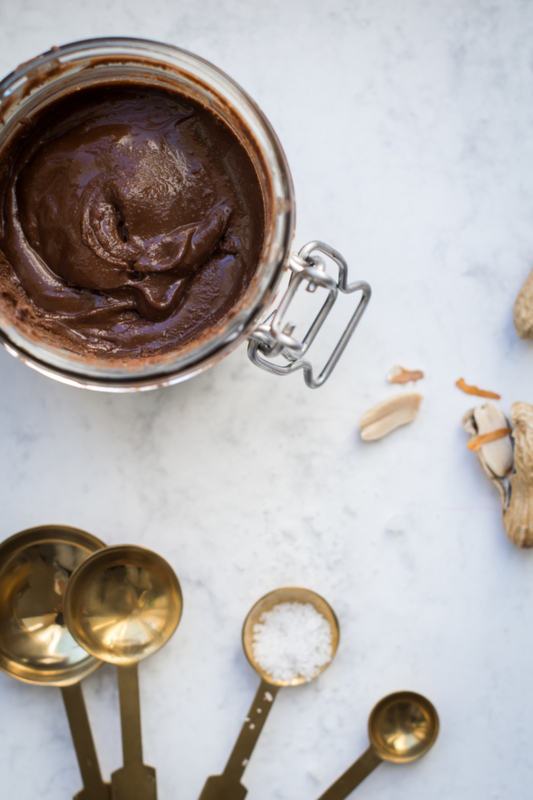 Prepare the chocolate cups: in a small pan over low heat or bain-marie, melt coconut oil, cacao powder and maple syrup while keep stirring - or just melt dark chocolate for the ones who chose this option. When the ganache is liquid, prepare 8 cupcake paper moulds. Pour 1,5 to 2 teaspoons of chocolate ganache in each of them, then let set in fridge for 15 minutes. 4. 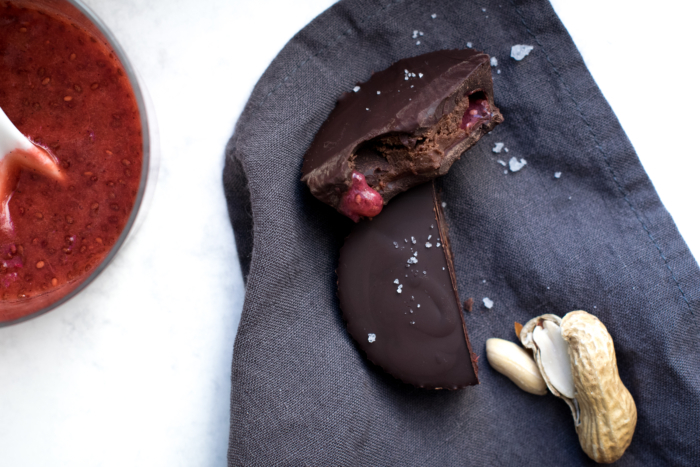 When set, take the chocolate shells from fridge, as well as the strawberry sauce. Top each chocolate basis with one good teaspoon of strawberry sauce, then with 1/2 to 1 teaspoon of chocolate peanut butter. When done, cover the whole with some chocolate ganache until you get a smooth surface. 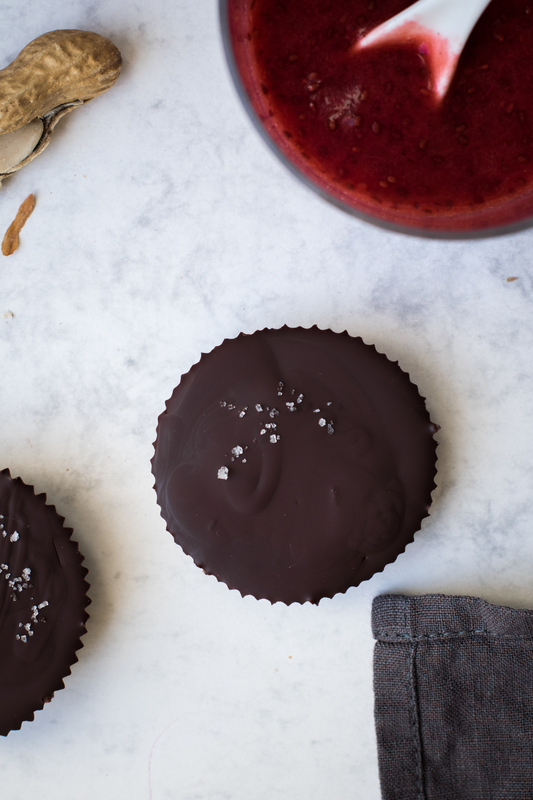 Repeat this process for each chocolate cup. 5. Put in fridge again for 30 minutes minimum, until the chocolate shells are totally set. 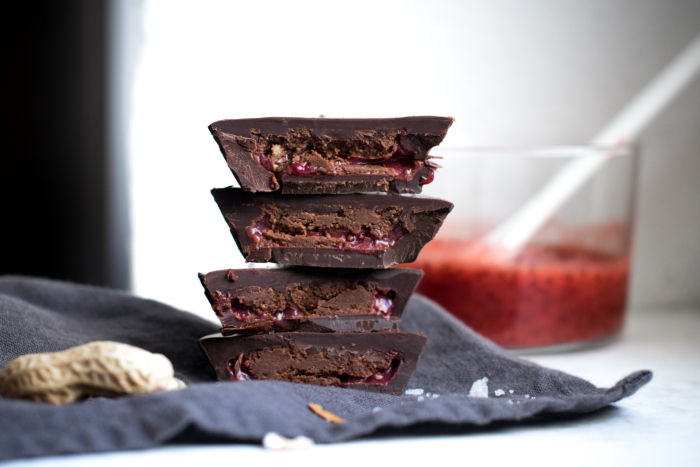 You can store the peanut butter and strawberry sauce chocolate cups for one week in airtight containers in fridge. Oh my! These look heavenly! Gotta try soon! Happy Friday!